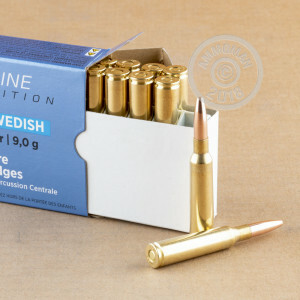 These 6.5x55mm Swedish cartridges from Prvi Partizan deliver excellent target shooting value for your rifle. 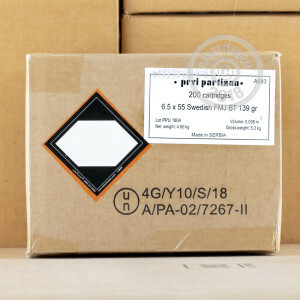 Manufactured to Western standard in Serbia, this ammo comes in boxes of 20 and fires a 139 grain full metal jacket bullet at 2,543 feet per second out of the muzzle. 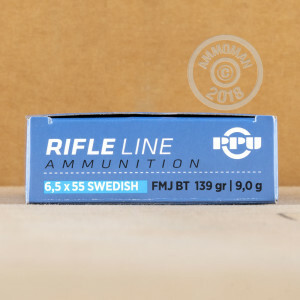 The 6.5x55mm Swedish cartridge sits roughly in the same power class as the .30-06 Springfield and delivers excellent accuracy at long range. Many Swedish rifles such as the Krag-Jorgensen, various Mauser variants, and the AG M/42 (Ljungman) fire this ammo. The 6.5mm and the guns chambered for it served in the armed forces of Sweden from 1894 to 1995, when Sweden adopted the 7.62 NATO cartridge. If 20 rounds doesn't sound like your idea of a real range session, you've come to the right place. AmmoMan.com offers free shipping for all orders over $99 so you can buy in bulk and save some serious money on your next few shooting trips! I received my ammo in 3 days without any problems, order was complete. Shot the PPU 6.5x55 from my 1915 Swedish Mauser at 600 yards at a 24" steel plate......9 out 10 hits. I was amazed and totally pleased !This was with open sights off a bench. Shot 200 rounds of the Wolf 5.45x39 with no malfunctions, good hits out to 300 yards w a Romanian AK74. I was very happy!